The Reward Challenge has the two tribes racing up a tower of obstacles, then launching sandbags from a slingshot to hit targets. It's actually not as physically unbalanced as you'd expect, especially since the slingshots require accuracy and not just sheer force. In the big surprise, Nagarote wins over the muscle-bound Escameca tribe. 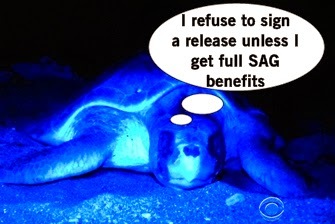 Their reward is a special night of feasting on beef stew, mac and cheese, and hot chocolate while watching turtles lay eggs. It's like Sue Ellen and the Clown Dog guy's date in Don't Tell Mom the Babysitter's Dead! Shall we go over what's happening across the tribes? J/K it's pretty much alllll Escameca this week minus a quick clip of Shireen feeling like she's alienated from Nagarote. So about Escameca. Rodney and Joaquin totally bro out on each other, finding a new ally in their island doucheyness. The word "bro" is used so much is honestly started to churn my stomach, so that word is officially dead. Rodney and Joaquin are ready to take over the game, so Joaquin hopes to bring a scorned Sierra into the mix eventhought she hates Rodney. So Rodney and Sierra pretend to squish their beef, but Rodney's ready to be the swing vote to control it all. Rodney says he's got Joaquin wrapped around his finger, suggesting to Mike they throw the challenge to vote out Joe. Ugh, why must they always target the ones with the most beautiful hair? The Immunity Challenge is a memory challenge to recreate the order of a serious of objects that are a Pinterest lover's dream. Jugs, candlesticks, candlebras, candles, message in a bottle... and some skull. If that's on your Pinterest board, um maybe make it a private board. Escameca begins their plan to throw it but either not everyone got the memo or they agreed to not make it obvious, sending the game into a 2-2 tie. This leads to a final match-up between Mike and Kelly (allies now on different tribes). After both fail on the first try, Mike tells Kelly to listen to him and audibly points everything out so Kelly will get the answer. Kelly STILL gets it wrong, cutting down to five items instead of six. Are we sure Kelly's head was OK enought to stay in the game? In round three after being extremely clear about how he would throw the challenge and give her the answers, Kelly wins/is handed immunity for Nagarote. I'm pretty sure after that headwound last week and all this thinking, Kelly is really hating her noggin. Mike admits throwing the challenge doesn't make him a happy man, but gave him clarity to see that Rodney's an untrustworthy threat. Uh, DUH BRO. Joe's the easy target as the only remaining No Collar, plus he's a challenge thread, so a handshake is had and all seems easy. Mike asks Joe where his head's at, pointing out that the White Collar guys are playing them all. To change the votes again though they'll need a swing vote and guess who that is? Sierra of course. As a reminder, Sierra hates Rodney and she hates Dan. To get Sierra's good graces again, Dan has to attempt another apology and he's still terrible at speaking but at least this apology is a step above the last few tries. Power couples must be stopped! Tribal Council time! 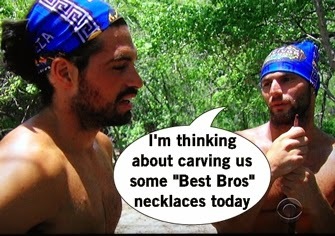 Probst's first question is about the tribe swap putting four blue collars together, but Joe points out there were cracks to exploit. 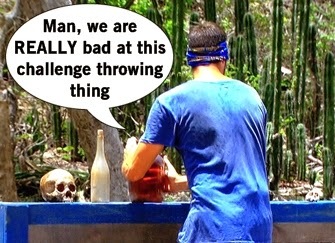 Sierra is named as the one who was most betrayed by the former tribe and most likely to flip. Rodney explains dropping buffs means new opportunities, which is true though I hate admitting someone so annoying is right. Sierra isn't mad she was voted for, instead she's upset because she felt attacked after the vote and only Mike was nice to her. "Who do I trust at this point?" Sierra asks and dear god, please trust the side that isn't the most annoying TV ever. The votes are cast and no idols are played because either Escameca's idol is actually hard to find or they're that dumb. 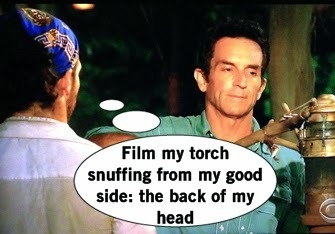 In a beautiful blindside, and I say beautiful because my god his hair, Joaquin is voted out of the game. True bro love doesn't last forever.